Cape Hatteras State Park is among a handful of North Carolina state parks that existed only for a brief time. On June 17, 1935, John S. Phipps donated land for a state park on the edge of the Outer Banks. 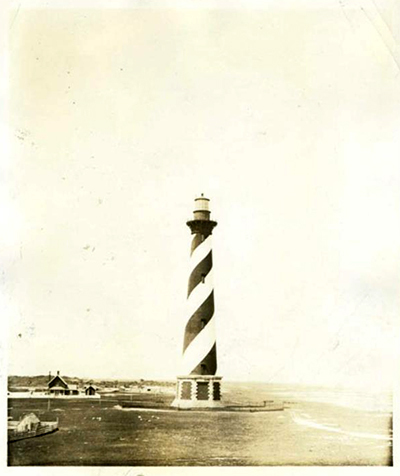 The land was adjacent to the Hatteras Light House. In the early years, park development plans included creation of facilities for picnicking, boating, and cabin lodging. On December 22, 1952, the state transfered the land to the federal government for inclusion in the Cape Hatteras National Seashore. North Carolina Department of Conservation and Development. North Carolina: today and tomorrow. 1936. North Carolina State Documents Collection, North Carolina Digital Collections. http://digital.ncdcr.gov/cdm/ref/collection/p249901coll22/id/698662 (accessed December 29, 2015). North Carolina Department of Conservation and Development. North Carolina's Natural Resources. North Carolina Resource Bulletin Series, 1952. http://digital.ncdcr.gov/cdm/ref/collection/p249901coll22/id/80397 (accessed December 29, 2015). Is there more info I can find out about the Park itself?